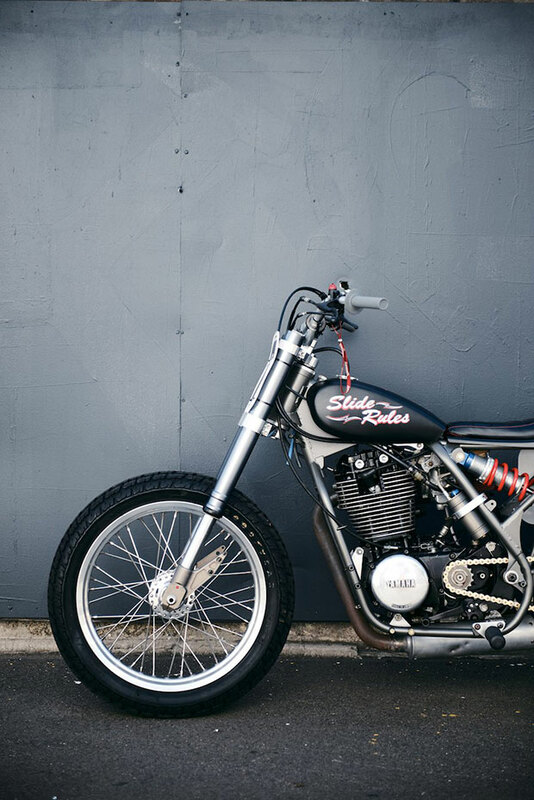 If you’re looking for a new ride at a great price then consider this Yamaha 500TT American Dirt Track Racer, being sold on consignment by the team at Deus Ex Machina, Australia. The Number 77 dirt track racer has every imaginable option already included and is built ready for racing immediately after you get your hands on it! The Yamaha 500TT Motor is perfectly balanced to provide massive power at a moment’s notice, with a Barnett clutch, Black Diamond valves, and Wiseco pistons with a YMF cam. The grey colored powder coated American CCM base has a nice slivery glint in the paintjob that gives it a very unique look while driving in the Aussie sunshine. The gas tank is replaced with a Red Max option and the seat was completely customized with a very individual design. Renthal grips and bar pad were included in the AFAM handlebars, and Goodyear Eagle rubbers were installed on both the front and rear. A Brembo rear braking system was also included to allow the rider to stop on a dime even while hooning around at speed. Even the foot-pegs were upgraded to Bates, proving that every inch of the Yamaha 500TT American Dirt Track Racer was carefully detailed from top to bottom.